Keywords: Contemporary House by the Lake Atitlan. Newly built and designed by internationally well known Czech/ American glass artist and his wife, 450 m2 modern fully equipped lakefront house in the beauty of 10.000 m2 landscaped garden and “One Hundred Years of Solitude”. Peace and quietness in comfort with more than 500 species of flowers and trees. We want to offer our guests some independence and let them choose where they will eat each day. A large, gourmet-equipped kitchen with full-size refrigerator, five burner gas stove with oven, dishwasher, coffee maker, vast collection of pots, pans and cooking utensils allows you to enjoy your own home cooked meals with herbs and vegetables from our organic garden. And of course, there’s a blender for those frosty tropical drinks! Our drinking Lab tested water is pure and healthy. If guests REQUIRE, they will find the kitchen fully stocked with foods for preparing their meal. Guests must restock products while they are here, or simply pay for it. There are couple shops in the village where basic foods, fruit and vegetable can be purchased (feel free to bring your own food if you have any alimentary restrictions or special needs), and there are several small restaurants in San Marcos where you can try the local or international cooking. For the daily shopping, our guests can take advantage of 30 min. boat rides to the village of Panajachel or San Pedro. Available only upon request! In the morning and evening, guests may dine at the house where Dita prepares tasty breakfast and dinners of homemade international gourmet cuisine, using the organic products grown on the garden for vegetarians, or freshly delivered organic meat or fish. Blueberry pie with cappuccino after you siesta time or homemade rye bread with hummus or grilled eggplant as a starter before your dinner? A selection of international wines is also available. sunset or a view of active volcano in Antigua. Or just sit on the pier and enjoy seeing the sky light up with the light of distant electrical storms as they pass by jump in the lake. On top of the roof you can enjoy the different breathtaking lake views, volcanoes and the stars at the night. You can be yourself or retired early while others are still operating the blender, rating one of the many recipes in kitchen or painting/writing . The house has 3 large bedrooms with high ceilings and hammocks, hardwood floors, antique rugs and art collection. The sleep arrangement offer two King-sized and one Queen-sized bed with 100% cotton bed linens. Bath and beach towels and toiletries are provided. The crystal clear water with local fishermen out in their small boats is ideal for swimming all year around. The house is in short walking distance( exactly 1 mile) to everything San Marcos has to offer. San Marcos is one of the bright colored indigenous villages on the lake, when you can enjoy yoga, massage, Spanish class, restaurants, music, local market, or just walk on surrounding landscape of blue sky, majestic volcanoes and feel the taste of authentic culture of the Mayan people. If your reservation is cancelled fewer than 21 days in advance of your arrival date, no refunds will be made unless the property is re-rented. If the property is re-rented, all monies shall be refunded, minus the $75 cancellation fee. Accessible by boat or car. We are happy to arrange for airport pickup upon your arrival, recommend a good hotel in Antigua and anything you need. Standard check in: 3 PM check out at 11.30 AM or by previous arrangement. Keywords: Contemporary House by the Lake Atitlan. Newly built and designed ( 2006) by internationally well known Czech/ American glass artist and his wife, 450 m2 modern fully equipped lakefront house in the beauty of 10.000 m2 landscaped garden and “One Hundred Years of Solitude”. Peace and quietness in comfort with more than 500 species of flowers and trees. Peace and quietness in comfort with more than 500 species of flowers and trees with private water access and view of 3 majestic volcanoes. Total privacy in paradise with all you need, accessible by boat , helicopter or car. Kitchen fully stocked with local organic foods/products for preparing your meals and fresh juices. Private beach, all year around swimming Your healthy meal can be prepared on your request :) as well as private yoga and meditation, massage in the house. Master bathroom located on the 1 floor has 1 toilet, 2 sinks, one cast iron large bath overlooking the lake. Next to the entrance of the master bathroom is separate men 'pissoar'room. Second bathroom has one toilet, one sink and one large rain shower, has own entrance and window, its not connected to any bedroom. Last toilet with washer is located outside of the kitchen for visitors. We include line of exclusive macadamia cosmetics shampoo, conditioner, and soaps. Facial, hand,foot, body creams are available. All imported quality cotton linens, pillows quilts & blankets, towels. Italien, sponges & scouring pads.basic cleaning supplies, dish washer tablets. Since we live in the house majority of the year and we like to cook gourmet food our place is honestly fully equipped. All condiments and spices are provided. You are welcome to harvest our or.veg. Our dining area is one open space of 100m2, including kitchen and living area with open fireplace, suspended over the water with almost 180 degree view of the lake. Extra seats & catering available. We always start with for us important details as fresh flowers in each of your room@living area and of course organic coffee ready to enjoy upon your arrival. Our guest are welcome to harvest anything they like in our property. We have 3 org.vegetable gardens and more than 500 trees, incl.mango , lemon, papaya, avocado. We provide private session of yoga, massage and meditation as well as balance 'detox'diet incl.fresh juices on a daily basis. Our private taxi will pick you up at the airport and will bring you to the house. I would like to ask our guest if the party is coming for a special occasion or event. In those special cases, I'll make something sweet, bake a bread, prepare our pesto, shop for wine etc... I created a binder filled with events, places to go, local shopping info, places of worship and a restaurant guide, basic operating instructions, places to go, things to do, menus. You can design your own gift or souvenir made by our ecolibri.org women group from San Juan. 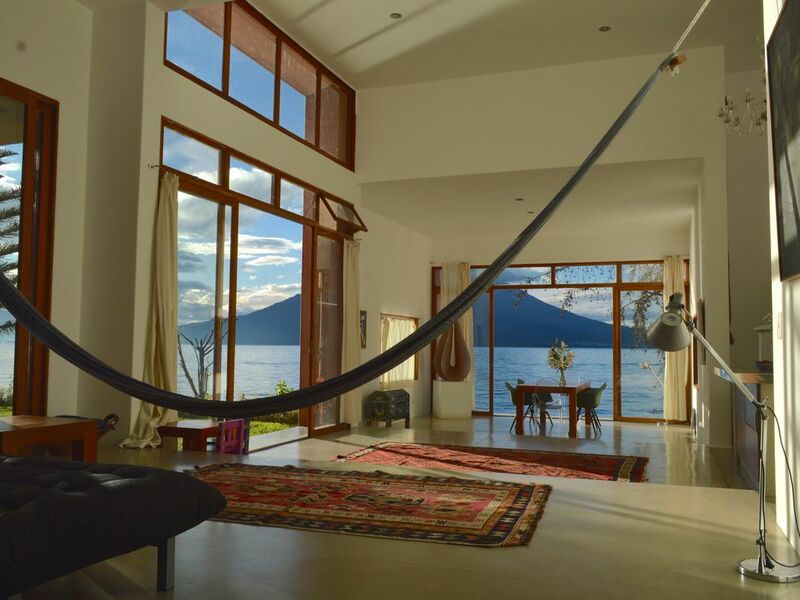 Awesome House right on Lake Atitlan! We spent four days at Dita and Michael"s house. What an incredible house on a spectacular lake. The house is only about a 5 minute boat ride (or a 20 minute walk to the village of San Marcos. The owners are great to deal with, they will arrange everything for you incfor luding shuttle transportation back and forth to the airport in Guatemala City. While you are there contact Luis at Lake Atitlan Day Tours for horseback tidings, hiking, tours of the villages etc. He is great. Thank you again Dita and Michael! Four of us had a wonderful time at Dita and Miguels beautiful home. I can't even describe how beautiful it was seeing the launches pass seemingly a few feet away on the lake. It was so easy getting on and off the launches from their private dock to any of the villages around the lake. Dita was incredibly helpful with places to go and things to do. It was a wonderful week!!! Beautiful home on enchanted waters! My wife and I traveled with friends to this lovely home on the enchanted volcanic lake known as Lago de Atitlan. The owner, Dita, worked out our shuttle and boat arrangements, made us two fabulous meals and offered to help us with any detail of our stay, no matter how big or small. It is difficult to describe the feeling of peace and tranquility that overtakes you as you gaze at the stars from the rooftop walkway off the master bedroom or arise to the sun coming up over ancient volcanoes. Imagine having dinner as the waters lap below you or breakfast as the lake shimmers with a thousand sparkling waves. As the boat pulled away from the dock outside this wonderful home, we knew that we would come back to this special place in the Guatemalan highlands. Rest for the mind, body and soul! Just returned with my family from a wonderful and restful vacation! The house was truly outstanding with dazzling views and more than enough room for our family of four. Sipping coffee in the morning looking out over a magical setting with beautiful blue skies, exploring unique little villages around the lake and relaxing at night star gazing, watching movies and reading was just what we needed for a restful vacation. Dita and Michael were incredible hosts and guides. They answered all of our questions, helped plan our day trips and gave us great tips. The amenities are fantastic -we asked Dita to stock the kitchen with some food before we came and found that very helpful. She cooked a delicious dinner for us upon our arrival for which we were truly appreciative after a long day of travel. We explored local villages, hiked, swam and learned about the beautiful Mayan culture, shopped the markets and tasted a multitude of different cuisines. Getting around by lancha was easy and local tuk-tuks were another fun and easy mode of transportation. We hope to return soon - it was an extraordinary experience in an exquisite environment. Enjoy! I highly recommend this house, perfectly situated within walking distance to San Marcos. The grounds are beautifully kept, with plenty of space and privacy. The house, itself, is beautiful, spacious, full of works of art. We were greatly pleased with the breakfasts and dinners cooked by Dita. Lake Atitlan, itself, is a wonderful place. Each day of our stay, we took the boat to different villages to explore the local Mayan culture. The hike up the San Pedro volcano was an exhilarating experience. Dita was a generous host, who gave us many helpful tips, and ensured our plans were full of exciting things to do around the lake. We look forward to returning. My husband and I have spent an amazing and relaxing time at Dita´s and Michael´s beautiful house. The location is magic, the house offers great comfort and Dita and Michael are great hosts. The swimm in the lake is incredible as is the view from the panoramatic window. We loved it! PRICE PER WEEK IS CALCULATED FOR OCCUPANCY OF 4 ADULTS For 3 night stay, 100% payment due at booking - I require my guest to make one payment.